Polly Sierer has won a controversial Newark Mayoral election. We extend our congratulations to her. It is our sincere hope that she will work with citizens and advocates for a better, more bicycle-friendly Newark. Following is the letter that we will send to Polly, welcoming her to her new position. On behalf of Delaware Bikes, I would like to congratulate you as you begin serving the City of Newark as Mayor. I would also like to offer our assistance to you, in the sincere hope that together we can continue to encourage Newark's efforts towards a truly bicycle friendly city. As advocates, we know that no one can accomplish goals alone. We need cooperation and good will among everyone who cares about bicycling in Newark - Advocates, the Newark Bicycle Committee, the Newark Bike Project, the Delaware Trail Spinners, and of course our citizens. And at the helm, we need a bicycle friendly Mayor, one that will be concerned enough, and brave enough, to share our vision, and make positive changes happen. Newark proper currently enjoys a nearly 5% bicycle modeshare (higher on Main Street), making bicycling a serious part of the transportation system. To put that number in perspective, if you were to convert it to cars on Main Street, that would have serious impact on an already existing congestion problem. We encourage you to think creatively in terms of reducing congestion downtown, not encouraging more of it as some candidates suggested. 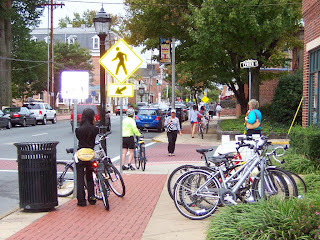 For example, if the City surveyed motorists parking on Main Street, they would find a large percentage that live within walking or biking distance. Converting just some of these trips would have a very positive impact on our quality of life downtown. The City should repair its apparently damaged relationship with the University of Delaware, and work jointly to offer serious car-free or car-lite incentives to students who live within a mile of Main Street. Car sharing services could also be offered. By helping to improve the existing infrastructure, which favors motorized traffic, and creating new facilities, we can encourage more citizens to walk and ride their bikes, lessening their dependence on cars. Our citizens will be healthier, happier, and economically more sound. Traffic will be more manageable, both on Main Street, and the streets that surround it. It is our hope that the policies you support as Mayor will help to continue to create a more walkable, bikeable Newark, and that the legacy you leave will be one that you can be proud of. We hope that you will consider meeting with us, at your convenience, to discuss our concerns, as well as our ideas to help make Newark truly bicycle friendly. Poster's note: Clearly, bicycling is a significant part of the transportation system in Newark. Yet, for all but one candidate, making Main Street more car-friendly appeared a much more important issue.